Previous studies have demonstrated the protective effects of consuming seafood in preventing dementia and Alzheimer’s disease. Seafood, especially salmon, mackerel, sardines, trout, and herring are all rich in omega-3 fatty acids, which are an important part for regular brain functioning. However, seafood also contains mercury, a neurotoxin that can be destructive to or affect proper functioning and development of brain tissue. The toxic effects of mercury are usually neutralized by the mineral selenium—an essential nutrient that strongly binds to mercury. Selenium is also found in seafood, therefore the effects mercury may have in the development of dementia and Alzheimer’s disease are not well known. Researchers from Rush University investigated the association between the development of dementia with dietary intake of omega-3 fatty acids, while evaluating the brain levels of mercury and selenium. There were 286 participants in this cross-sectional study who were originally part of the Rush Memory and Aging Project (MAP). Researchers followed individuals residing in retirement communities and subsidized housing in the Chicago area for at least four-and-a-half years until their death. Upon enrollment, all participants had no history of dementia, participated in yearly neurological evaluations, and agreed to a brain autopsy upon death. They also completed food frequency questionnaires in order to assess dietary and supplementary intake of seafood and omega-3 fatty acids. Upon death, neurologists examined and analyzed their brains for Alzheimer’s disease and determined concentration levels of mercury and selenium. 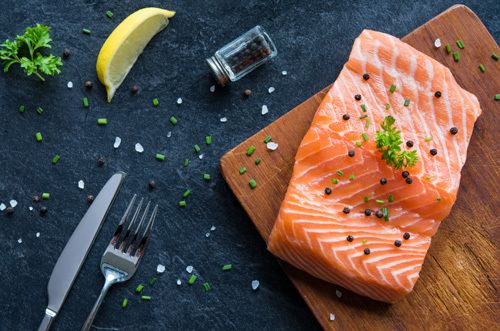 Findings revealed that among individuals who consumed seafood at least once per week, their chances of developing Alzheimer’s disease was reduced, specifically among those with a genetic predisposition. Upon evaluating levels of mercury, researchers found that higher levels of mercury were associated with an increased number of seafood meals consumed each week. However, they found no association between elevated levels of mercury and developing Alzheimer’s disease or any other brain disease. Incorporating omega-3 fatty acids have been known to be extremely important in brain functioning and the study’s findings found that increasing one’s intake of omega-3 reduced the risks of dead brain tissue. More so, dietary intake of omega-3 fatty acids demonstrated these beneficial effects, but there were no significant beneficial associations among those consuming fish oil supplements. Perhaps because there was such a minimal number of participants consuming supplements it was difficult to conclude whether they play as much of a significant role in brain health and disease prevention. You should definitely make sure to regularly consume seafood rich in omega-3 fatty acids. Moderate consumption, especially among genetic carriers of Alzheimer’s disease, can significantly reduce the odds of developing any type of brain disease later on in life. The benefits outweigh the risks for incorporating more seafood. You might be increasing your intake of mercury; however the increased levels play no significant role for brain disease development. “A major concern in public health was whether the increased mercury exposure that comes from consuming seafood might have harmful effects on the brain as we age. This study provides evidence that the increased mercury exposure is not correlated with increased brain pathologies associated with dementia,” stated lead author, Martha Clare Morris. Morris, M.C., et al., “Association of Seafood Consumption, Brain Mercury Level, and APOE ε4 Status With Brain Neuropathology in Older Adults,” JAMA, 2016; DOI:10.1001/jama.2015.19451.